Know the contents of a DCP already by its file name. Receive at a glance all the important information such as language, resolution, frame rate, and much more ..
For the use of the kinofreund DCP Naming Tool no special knowledge is needed. Generate your filenames using our handy "wizard". The DCP Naming Tool is a free service of the kinofreund cooperative! What is the DCP Naming Tool? 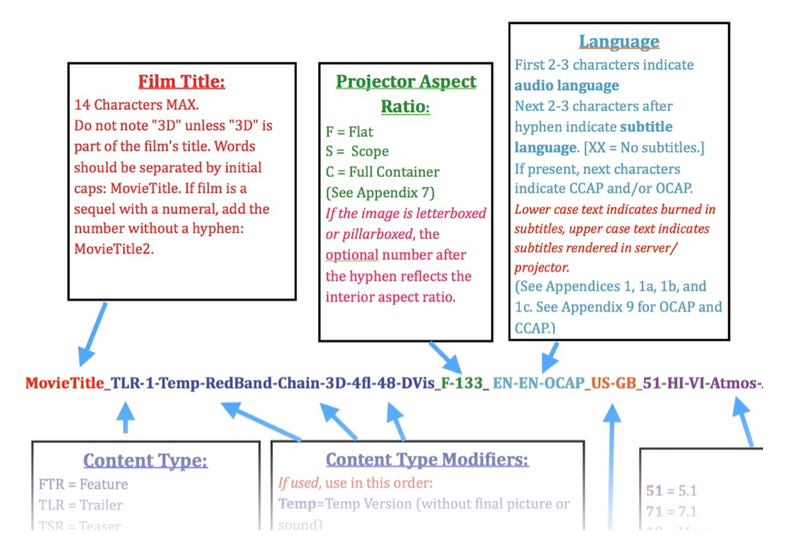 The kinofreund DCP Naming tool is a public and free online tool for reading as well as for the generation of DCP filenames by a "wizard" or an "expert mode". So you can quickly determine what content is in a DCP and generate your own file names even without knowledge of the naming convention. We see a great need in the industry to standardize the naming of files. Years ago, Mark Harrah and Jerry Pierce of Disney have thought about DCPs and invented the "Digital Cinema Naming Convention". The aim was to identify the content of DCPs already by its name. However, since there are a number of possible combinations of content, file naming is correspondingly complex despite simplifying abbreviations. In addition, the naming convention is continuously expanding to keep up with the technological developments of the digital cinema. So it is hard to remain as a sporadic users up-to-date and to keep in mind the naming abbreviations. For example, many do not know that a lowercase subtitle abbreviation (e.g. "... EN-de", for English language with German subtitles) means that they are hardcoded, unlike hidable subtitles that are marked as a big abbreviation ( "... EN-DE"). Actually very convenient, however, just a few adhere to the full naming convention, often simply so because it is so complex.